Last night I thought about posting a question on the Amazon forums asking readers for help on writing this article. I wanted to know what they liked and didn’t like about Authors’ marketing and promoting their books. I decided against it about three seconds after I did a search on author’s marketing themselves. What I learned shocked me, but didn’t really surprise me that most efforts Author’s utilize to sell their books really annoy readers. Over the years, I’ve studied different methods of marketing that fit what I’m comfortable with and below I’ve compiled a list of non-aggressive marketing tips that are budget friendly. I hope these helped and good luck all of you. ~Know your target audience and create a brand that appeals to you and projects the image you want for your writing career. With your brand in mind, repeat yourself in all your ads, webpages, etc to establish that brand in the minds of readers. For example: My author brand is “Where myths live, where legends walk, and where love is eternal.” I write Speculative fiction. ~When you finish a book, write the next one, and the next one, and the next one. Keep writing books. 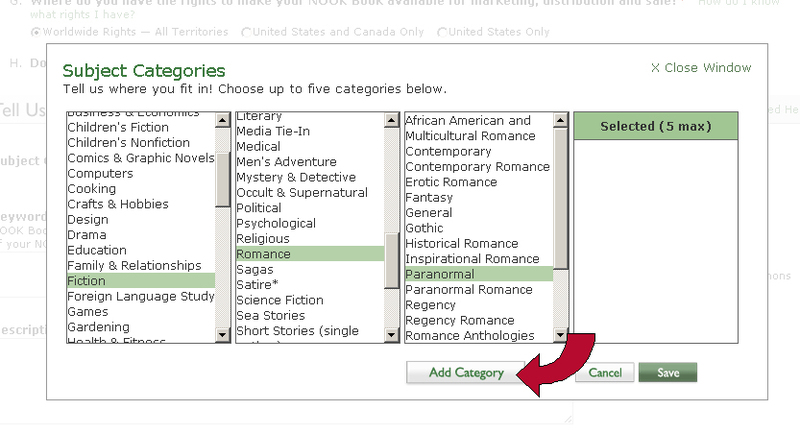 Create a backlist. The authors that sell well are the ones that write. It doesn’t cost much more than time, effort, and maybe paper. ~Upload to every book site available and fill out their author profile pages. Some readers like to know the author. My favorites are Amazon, Barnes & Noble, and Smashwords. Not only do you get better royalties by doing this, but you can also track your sales. ~Offer Readers something for free. When readers receive something of value for free, trust and good feeling naturally arise. It is a very effective marketing strategy. This doesn’t have to be a full length book. Write a short story geared toward the readers you want to attract and offer it as a free read or bonus material at the end of a related book. Give the people on your mailing list or newsletter sneak peeks at a story. You can give them a coupon or some type of special they can share with friends. 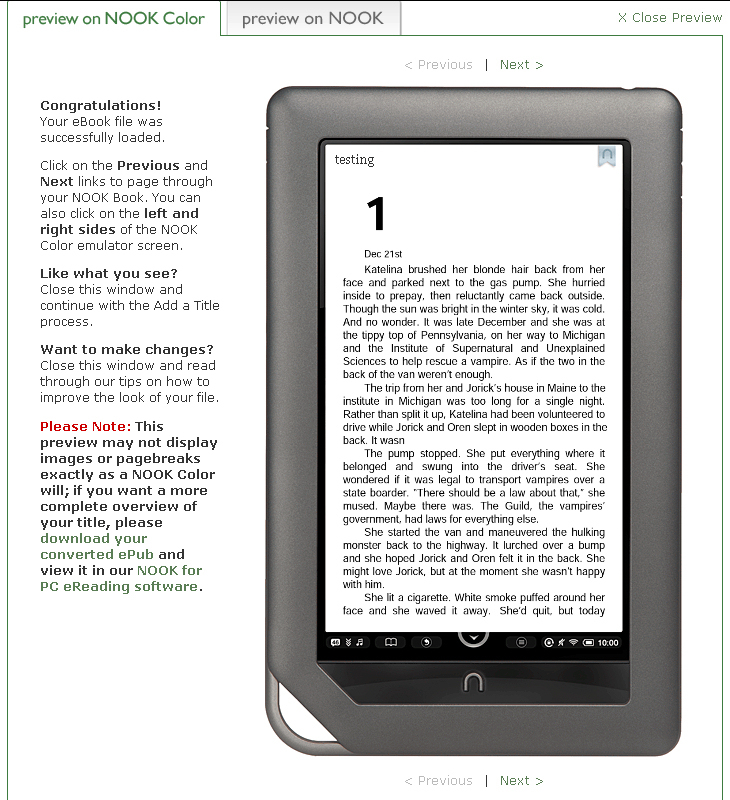 ~Run a contest giving out free e-books. Or have a treasure hunt where they buy the books to find clues and win something big. Or do a giveaway and ask everyone who downloads the book to please leave an honest review. ~Social Networking with Twitter, Facebook, and GooglePlus and the hundred of other sites out there are great ways to stay connected and keep your name active. Also sign up for reading sites like GoodReads and Shelfari, or creating a Youtube channel with a list of songs that go well with your story or author interviews is a great way to get people to notice you. You can then get widgets for all of these sites and place them on your website so people can easily find you on the web. ~Book trailers are a great way to show readers what your book is all about. You can upload it to Youtube and Tweet the link with relevant hashtags to get it out to people with similar interests. ~Join forums if you dare. Forums and group discussions can be great places to meet people. But be sure not to self-promote. Not only will it turn readers off, it can turn nasty fast. Amazon has created a special ‘Meet the Authors’ forum where authors can promote their books and talk about their work. ~Most people won’t give a book a second glance if it has not received any reviews, good or bad. I found that offering your book for free and asking for honest non-biased reviews can get you those reviews. But don’t expect them to be all nice. You can also send your book to bloggers and reviewers. ~Make flyers, brochures, postcards or pens with information about your books. I’ve never tried this but it could be worth it to make a flyer or brochures and place them in public places, giveaway flyers, brochures, or postcards to people who ask about your book, etc. Please make sure it’s okay with the owners first or it’s at a place where it is okay to put them. Bathroom stalls, libraries, and bulletin boards are good places. Network with another author and do an exchange of flyers. Pens can be given away, or left for people to use. I don’t know about you, but I do read the writing on the sides of pens. ~Create relationships with readers, writers, reporters, book sellers, book clubs, bloggers, teachers, etc. Word of mouth is still the most cost-effective way to advertise your books. 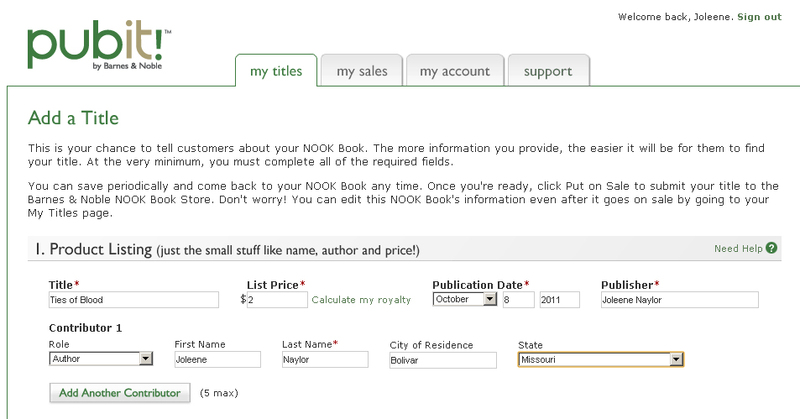 This opens a new page where you need to enter your title, list price, publication date, publisher, and contributors. These are you – as the author – and then any illustrators, co-authors, etc. You are allowed up to five. If the conversion looks good, then it’s time to upload your cover. (if not, make changes to the interior file and reupload.) Your cover image MUST be a .jpg and has to be at least 750 pixels tall, but no bigger than 2000. To upload the cover use the browse button. Now to fill out the pesky questions that caused all those crabby “errors”. 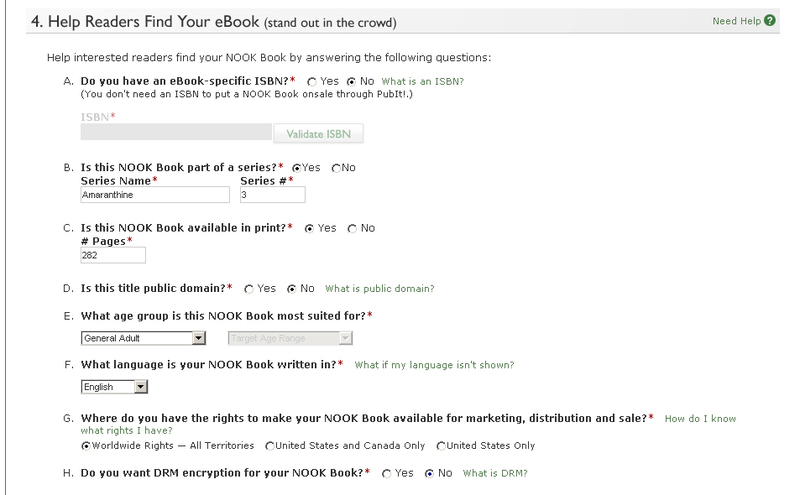 They’re pretty easy: Do you have an ISBN? Is the book part of a series? Is it available in print and, if so, how many pages is it? Is it public domain? What group is it suited for? What language is it in? Where do you have publishing rights (aka, US, IS?Canada, or World Wide) and do you want DRM protection? 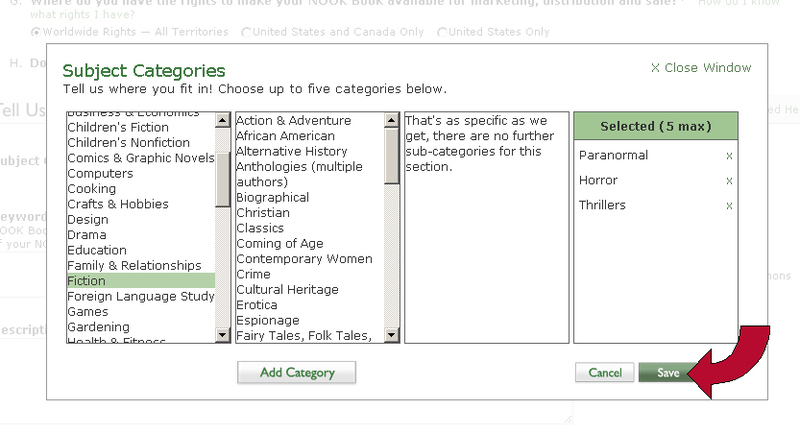 You can choose up to five categories for your book, though you don;t have to pick that many (I have only three). When you’re done, click Save. 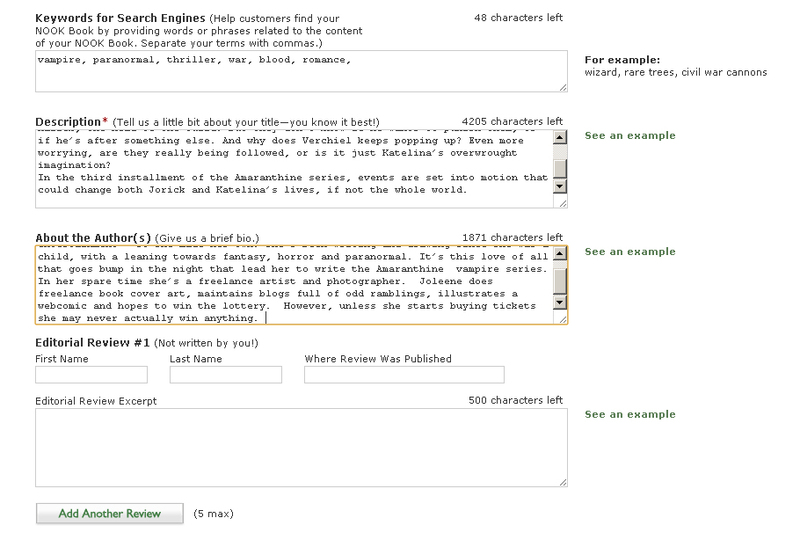 Now it’s time to enter your keywords (separated by commas), your book description and your author bio. You can also enter editorial reviews if you have them. And that’s it! Now you just need to wait 24 – 72 hours for your book to become available through B&N. On a side note, there was a rumor that Barnes & Noble promotes books published through pubit over those through Smashwords, so i have done some experimenting. So, it’s safe to say that in this case that B&N isn’t pushing the pubit version over the smashwords. Whether it happens to other people I can’t say.